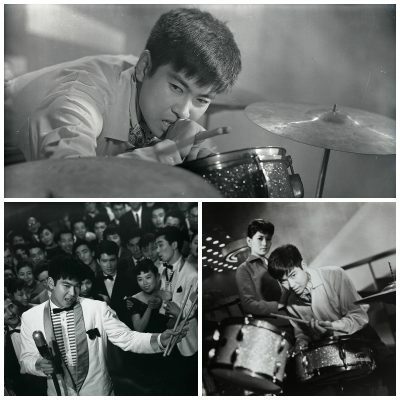 Yujiro Ishihara, the biggest male film and singing star in postwar Japan, plays a rough drummer given his big break by female talent manager Mie Kitahara. A series of love triangles set within the Tokyo music scene plays out in moody Eastmancolor, but this film is less noir than male melodrama: the central problem is neither corruption nor romance but the lack of a mother’s love. Yujiro is both lover and fighter, performing self-assertion and sexual prowess for male and female audiences in conformist Japan. Directed by Umetsugu Inoue, one of the major directors of postwar musicals, who even inserted song and dance performances into his action films.